Formed in different periods of history, the beautiful and varied Aeolian islands provide a unique example of volcanic island building. 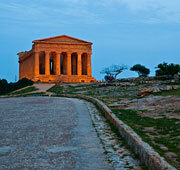 The Greeks named the group of islands just off the shores of Sicily after Aeolus - the keeper of the winds. Whilst, in the winter these windswept rocky isles are home to only 12,000 people, in the summer thousands of visitors come to sunbathe on the lovely beaches and to swim and dive in the crystal clear waters. The easiest way to reach the archipelago is from Milazzo in Northern Sicily. 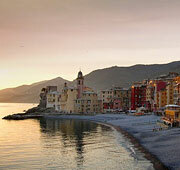 There are also ferry services from Palermo and Naples. 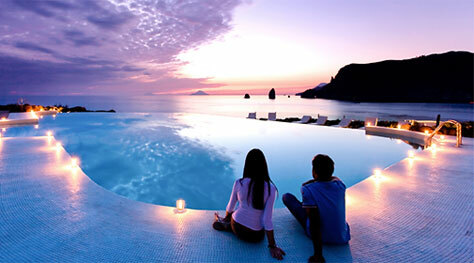 The largest and, the oldest, volcanic island is Lipari. The surrounding waters are the palest blue - the paleness caused by the processing of talcum, which, along with that of pumice, was once the main industry. In the little towns of Canneto, Aquacalda, Pianoconte and Quattropani there are interesting churches to visit. 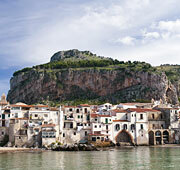 For a panoramic view of islands you have yet to visit, and the surrounding sea, climb to the top of Mount Sant'Angelo. Believed by the Romans to be the chimney of Vulcan's workshop, Vulcano is a younger, still active Vulcano, which last erupted in 1880-1890. Here the sands and rocks range color from yellow to red to grey to black. The topography has been formed by several craters, which have overlapped, the most recently active crater being the Gran Cratere. For an unforgettable trek across a Martian landscape, ascend to the top of the Della Fossa, winding through a yellow mist of sulphur rising from active fumaroles, and emerge to experience the fabulous sight of islands as far away as Panarea and Stromboli. Sounds too strenuous? Take a dip in the hot sea washing the Fumarole beach or a therapeutic bath in one of the island's famous fango, or mud baths! Northwest of Lipari lies the garden island - Salina - so named because of the salt lake at Lingua. The many water sources have made this isle a green paradise. The hills are covered with a profusion of Mediterranean flora, which reaches down to the cliffs' edge and the clear blue sea. On this verdant island Malvasia grapes can be grown and are used to make the local wine. There are three little towns, Malfa, Lingua and Leni. From one of the two ports, Santa Marina or Rinella you can take a ferry Westwards to explore Panarea. The tiny island of Panarea has become popular with Italy's VIPs and in the port of San Pietro you will find any number of up-market shops, eateries and nightclubs. In contrast, Panarea has its own mini archipelago of islets, the largest being Basiluzzo, which are totally untouched by tourism. Sailing North you reach one of the most active volcanoes on earth - Stromboli. At a height of 900meters, the cone is visible for miles. Here picturesque and elemental combine. Beneath the smouldering mountain the beaches are the darkest black, the water very, very deep. Tourism is now the main source of income and there are many shops and restaurants in the two main settlements - Stromboli and Ginostra. 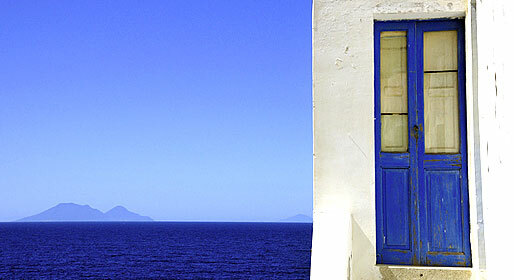 The most Westerly and the most remote islands, Filicudi and Alicudi offer a complete contrast to the other islands. Much of the unique, high terrain of Filicudi, with its rocky inlets and sea caves, has been made a Regional Park. Named after the Phoenicians who once dwelt here, the island is criss-crossed by an amazing system of stone walkways. Ferns cover the slopes of the crater of the, now long extinct, volcano which formed this island, Monte Fossa Felici. The crater rises 774metres above the port and the villages of Valdichiesa and Pecorini a Mare. The beauty of Filicudi and its surrounding waters (marvellous for snorkelling) draws hundreds of holidaymakers to the island every year. The crater of Mount Filo dell'Arpa soars above Alicudi, the island of heather. The slopes are covered in colorful bougainvillea, succulents, prickly pear, capers, olive trees and grape vines. The few houses are scattered on the less steep, Eastern side of the mountain. The Mediterranean with its bountiful sea life washes against a jagged coastline. There is no sound of traffic here, there are no motor vehicles to disturb the peace of this island sanctuary.